In spite of earlier promises to the Eurogroup the Greek government continues to persecute former head of ELSTAT Andreas Georgiou and two of his former senior staff. As long as the never-ending prosecutions continue the Greek government cannot claim it is seriously committed to turn the country around. By continuing these persecutions the Greek government is clinging to the story that the fraudulent statistics from around 2000 to 2009 are the correct ones, thereby in effect presenting the 2010 revisions as criminal misreporting. Thus, the Eurogroup and other international partners should refuse to cooperate with the Greek government as long as these trials continue. In spite of earlier acquittals time and again, Greek authorities keep finding new ways to prosecute the former head of ELSTAT. The latest development happened last week, July 18 and 19. As at the trial in May, there was a shouting and insulting mob of around thirty people present in court at the trial on July 18 when Georgiou was being tried for alleged violation of duty. The mob was clearly cheering on the accusation witnesses in a disturbing way; again, something that would be unthinkable in any civilised country. On July 19, the Chief Prosecutor of the Greek Supreme Court proposed yet again to annul the acquittal of Georgiou and two senior ELSTAT staff for allegedly intentionally inflating the 2009 government deficit and causing Greece a damage of €171bn. After being unanimously found innocent of charges of violation of duty in December last year by a panel of three judges, as the trial prosecutor had recommended, this acquittal was annulled by another prosecutor. This is how this farce and mockery of justice has been kept going: acquittals are annulled and on goes the persecution. This trial will now continue on 31 July when judgement is also expected – and it can be fully expected that Georgiou will be found guilty. This report from Pastras Times gives an idea of the atmosphere at the trial: The professor [Z. Georganda] argued that from the data she has at her disposal, she considers that the 2009 government deficit was around 4 to 5% [of GDP] – a statement, which ignited the reaction of the audience that began applauding and shouting: “Traitors” “Hang them on Syntagma square”… The witness continued her point arguing that Greece had one of the lowest deficits “but we could and we were paying our debts because there was economic activity. Georgiou led the country to prolonged recession.” Ms. Georganda said characteristically, causing the audience to explode anew. As everyone who knows the story of the discoveries made in 2009 and 2010 of the Greek state statistics Georganda’s arguments are a total travesty of the facts, a story earlier recounted on Icelog (here the long story of the fraudulent stats and the revisions in 2010; here some blogs on the course of this horrendous saga). July 19 was the deadline for the Chief Prosecutor of the Supreme Court, Xeni Demetriou to make a proposal for annulment of the decision of the Appeals Court Council to acquit Georgiou and two former senior ELSTAT staff of the charge of making false statements about the 2009 government deficit and causing Greece a damage of €171bn. Demitrou opted to propose to annul the acquittal decision. The Criminal Section of the Supreme Court will now consider her proposal for the annulment of the acquittal. If the latter agrees with the proposal of the Chief Prosecutor of Greece, the case will be re-examined by the Appeals Court Council. If the Appeals Court Council, under a new composition, then decides to not acquit Georgiou and his colleagues, the three will be subjected to full a trial by the Appeals Court. If convicted they face a sentence of up to life in prison. This would then be yet another round of the same case: in September 2015, the same Prosecutor of the Supreme Court, then a Deputy Prosecutor, proposed the annulment of the then existing acquittal decision of the Appeals Court Council. In August 2016, the Criminal Section of the Supreme Court agreed to this proposal, which is why the Appeals Court Council re-considered the case. And so it goes in circles, seemingly until the legal process gets to the “right result” – trial and conviction. Can the three ELSTAT staff get a fair trial? Given the fact that the same case goes in circles – with one part of the system agreeing to acquittals, which then are thrown out, in the same case – it can only be concluded that Andreas Georgiou and his two ELSTAT colleagues are indeed being persecuted for fulfilling the standard of EU law, as of course required by Eurostat and other international organisations. As this saga has been on-going for six years it seems that the three simply cannot get a fair hearing in Greece. This raises serious questions about the rule of law in Greece and the state of human rights there. 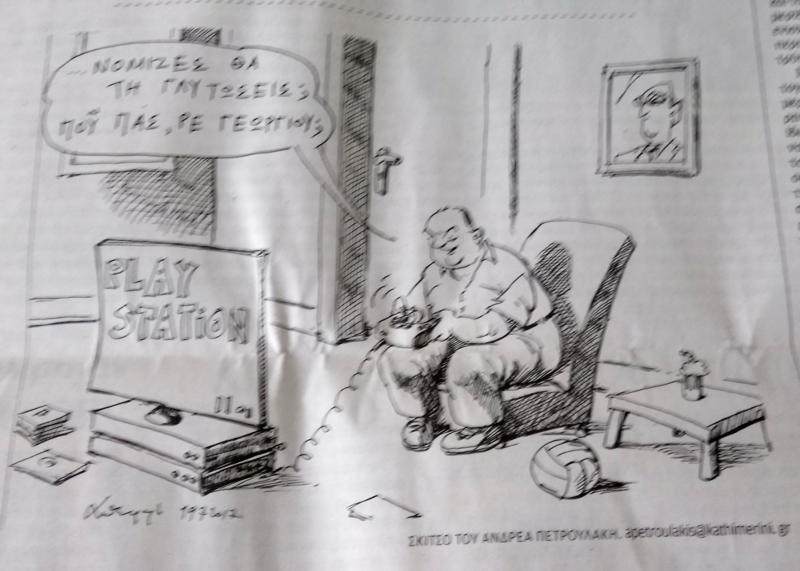 At the same time the last chapter in this six-year saga took place now in July, €7.7bn of EU taxpayer funds, a tranche of EU and IMF funds for Greece, was paid out. This, inter alia on the basis of the statistics revised in 2010, for which the Greek state keeps prosecuting the ELSTAT statisticians thereby de facto claiming these statistics were the product of criminal misreporting. In an apparent attempt to appease the Eurogroup, it was announced this week that ELSTAT will pay legal costs for the former ELSTAT employees facing trial. However, the legal provision proposed by the government is wholly inadequate and may actually do more harm than good to Georgiou and his colleagues. For example, it says that these official statisticians will have to return any funds they get if they are convicted. This is legislating perverse incentives. It is like saying: Convict them otherwise we will have to pay them. The proposed legislation also puts a very low limit on the amounts that would be covered. In addition, it would not cover costs of legal counsel, costs of interpretation of foreign witnesses, nor would it cover the cost of travel and accommodation of these witnesses when they come to Greece abroad to be defence witnesses for Georgiou. There also seems to be a labyrinthine process for accessing the funds making it unlikely the accused will ever see any reimbursement of cost. It is thus quite clear from events this week that not only has Tsakalotos broken the promise he gave to Draghi and the Eurogroup in May – he clearly has no intention of keeping it. The question is how long the Eurogroup will tolerate broken promises and the fact that by prosecuting the ELSTAT staff the Greek government does indeed keep portraying the revised statistics as criminal misreporting. « Will special counsel Mueller surprise with Icelandic Russia-related stories? Subscribe to comments with RSS or TrackBack to 'No end to the Greek government’s relentless persecution of ELSTAT staff'.